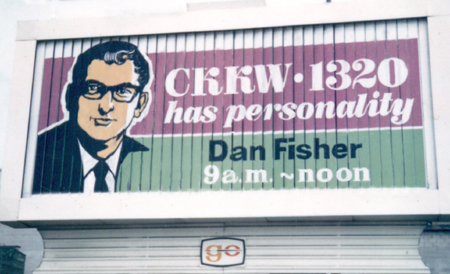 I was hired by Don Willcox to do the mid-morning shift on CKKW. Right off the bat we started a Housewives Club Bowling League at Victoria Bowl on Victoria Street South. At one time at the peak of the league we had nearly 3000 ladies in the club and bowling. Banquets were held at Bingeman Park in the large ballroom, where we took up every available inch of space. 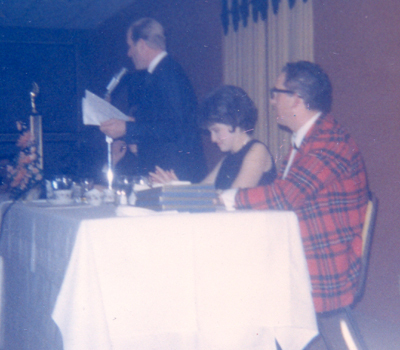 Don Walker was the owner of Victoria Bowl, seen here acting as the MC, [ that's Gwen and me at the head table]. We developed a great relationship with Don and his wife. I would imagine we were the largest ladies bowling league in the twin cities. There was great sponsor support of the league and wonderful prizes given out each year. 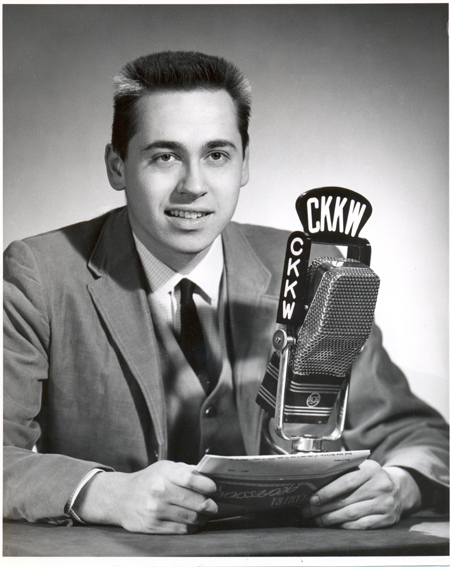 In 1966 I became the Program Manager of CKKW, and my on air duties were confined to a daily talk show called "Opinion". Here we're doing a show with Kitchener Mayor Sid McLennan. I did the show for 17 years and welcomed many leading political figures as guests. People such as Hon. Pierre Trudeau, Hon. Joe Clark, Hon Robert Stanfield,Hon. John Diefenbaker, Bill Davis, Robert Nixon, David Lewis as well as local MPs, MPPs and municipal politicians, mayors, aldermen, school board officials; as well as authors such as Pierre Berton, June Callwood; celebrities like Don Harron, Col. Harlan Sanders and hundreds of others. 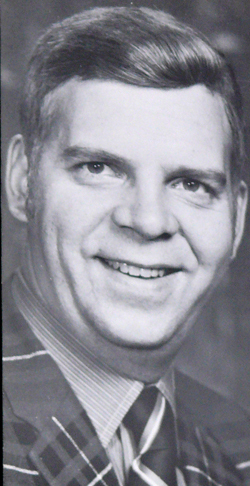 In the 40 plus years I have made Kitchener/Waterloo my home I have been active with various organizations such as the Canadian Mental Health Association, the C.N.I.B., the Kinsmen Club, K-W Association of Disabled Adults. Past President and charter member of The Oktoberfest Lion's Club, Past Commander of the K-W Squadron of the Power and Sail Squadron, past member of the board of the Hardy Hearts, a cardiac rehabilitation group at K-W Hospital, was active with R.E.A.C.T. 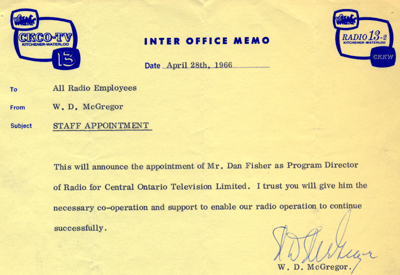 in broadcasting emergency information when required; chaired citizens committee examining salaries for the Waterloo County Board of Education, served on the Education Committee of the Kitchener Chamber of Commerce; have worked and promoted activities for Big Brothers, Big Sisters,Canadian Cancer Association,House of Friendship, the Working Center, K-W Association for the Deaf and Hard of Hearing, Waterloo Police Male Choir, Block Parents Program,Consumers Association of Canada, St. John's Soup Kitchen, St. Monica's House, United Way and Federated Appeal, Rotary Clubs of K-W, Freeport, St. Mary's and K-W Hospitals, K-W Home Builders Association, UNICEF, Waterloo Regional Police Child Safety Program, K-W Multicultural Association the Arthritis Association, Management Boards of Holy Trinity and St. Johns Anglican Churches, MacDonald's and M&M Meats Charity fund raisers. And I've been the MC and guest speaker at numerous community functions over the years. This picture would have been taken in 1962 sometime. 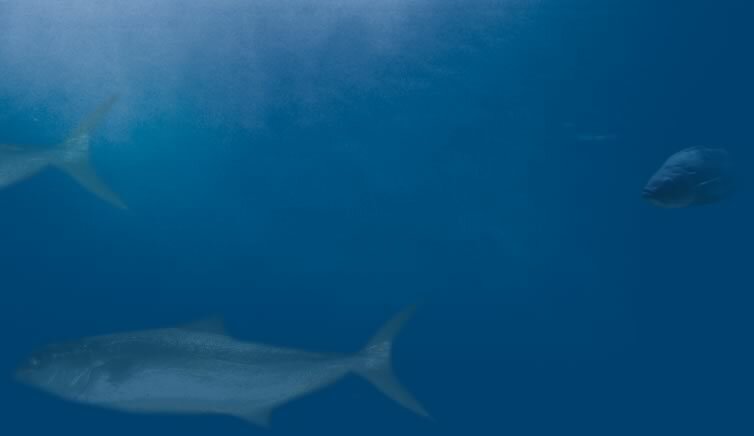 Bob has long since passed away. 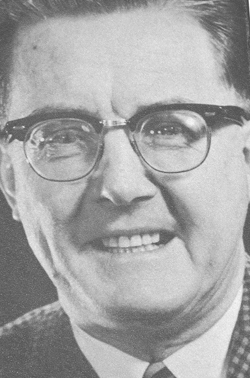 He was the original engineer of the station. 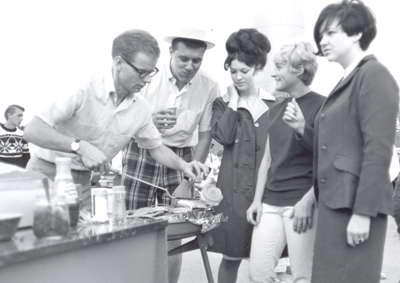 Here's John DeLazzer and Fred Merritt on location at a CKKW sponsored BBQ. John getting ready to serve the burgers. The gal on the far right in the dark suit was Paula ?? one of the station secretaries. I'm not sure who the other two ladies are, maybe some of you might remember their names, and Paula's last name. 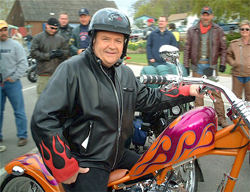 John left CKKW and went to TV Ontario where he remained until he retired. 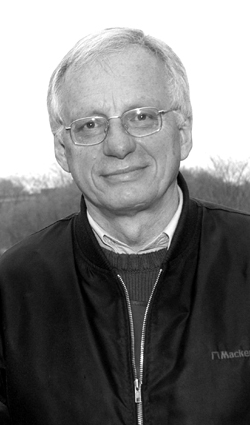 John was the consummate professional, and a super guy to work with. 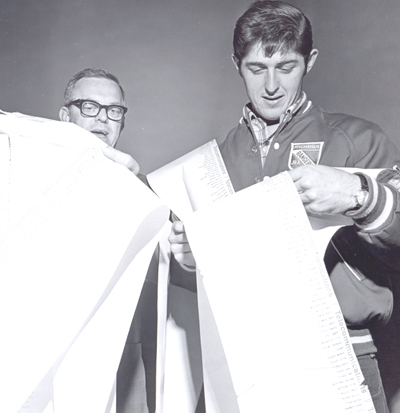 Here's Bill Inkol and Walter Tkaczuk going over a long long list of names of supporters of the Rangers who had signed in on a telegram to the team wishing them the best of luck in the Memorial Cup Finals. 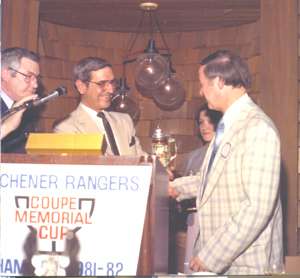 Not sure of the year, but it could have been the games in Windsor in 1981 ~ or it could have been the next year, 1982 when they won the cup over Sherbrooke. 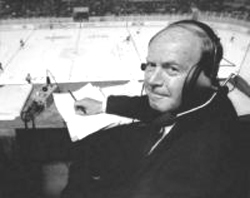 As I recall, from CKKW's standpoint, Hugh Bowman called the early games on radio, then Ron Reusch, and Mike Nolan. 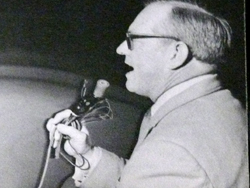 The home games were called on radio by Reg Sellner, who also called the play by play on TV. 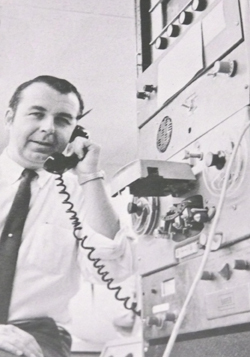 Bill Inkol then was thrust into the mix somewhere along the line, and then Don Cameron called the games for us when he joined the CKKW/CFCA/CKCO-TV sports department. I did color with Reusch and Nolan, working the last seasons of the E.P.H.L. Kitchener team, and then a few years with the Jr. Rangers after they came into the picture. Nolan and I also did Jr. B with the Siskins after the Rangers left the season early a few years. 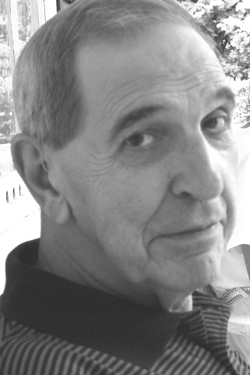 Mike is now a Prof at Western, and Ron is still on the air with CFCA in Montreal. 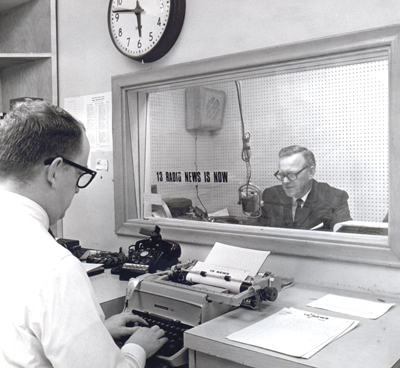 Don Willcox prepares a newscast as Bill Inkol, in the booth delivers a sportscast on CKKW. 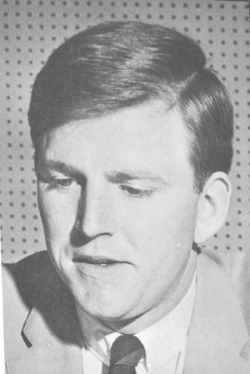 Bill eventually became the Sports Director of CKKW/CFCA/CKCO-TV. 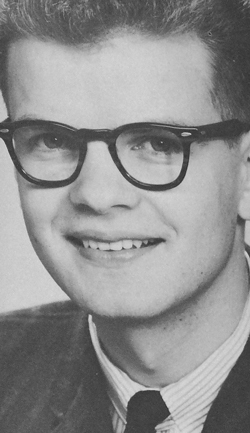 Don went on to become General Manager of CKKW/CFCA/CKCO-TV. Both are well known in the local community and each have been honored with various community awards over the years in recognition of their service. Hey...we have a winner!! 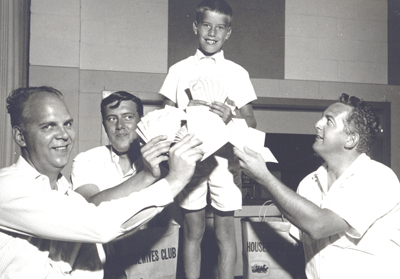 Here's Grant Hoffman , Fred Merritt and moi, handing out cash to a winner of a CKKW contest. I can't remember the occasion, but it really doesn't matter, the young lad seems pretty happy with his winnings! 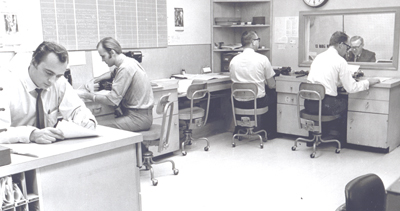 That's Terry Thomas on the left, Bill Baker is beside him, in the newsroom, Don and Bill on the right, and you'll have to help me with the other one. 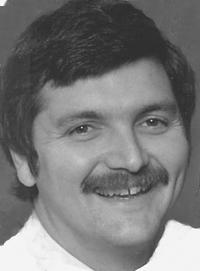 Terry left CKKW/CFCA/CKCO-TV and moved to Nova Scotia, where he was very active in radio in the Annapolis Valley. 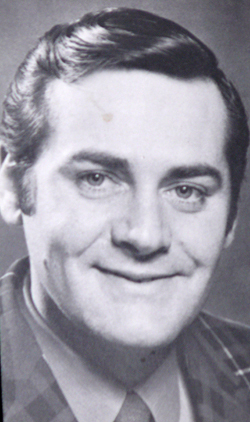 He died several years ago from a heart attack, but has a son in radio there, so the Thomas name goes on. 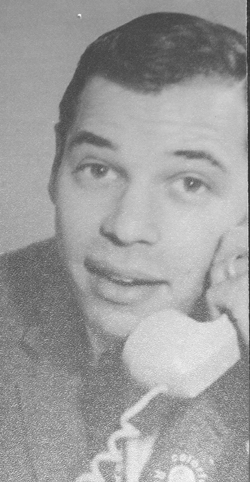 MIKE MARSHALL ~ This shot of Mike is likely from 1960 or 61. 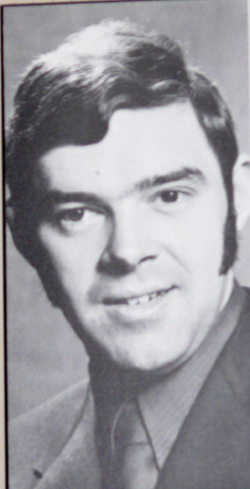 He was at CKKW, having come from Welland. 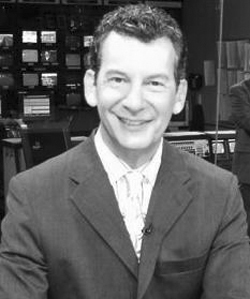 He left and went to CHML, and then on to a lengthy career in the business with stints out West and in Windsor, Toronto and his beloved CHML. Mike says he was about 19 years old when this picture was taken. I'm on the prowl for pictures of the early staff at the station and will post these gems as I come across them. A mature Fred Merritt,after 40 years in the KW market. I hired Fred from Chatham in 1966, and he has become one of the longest serving announcers in the region. 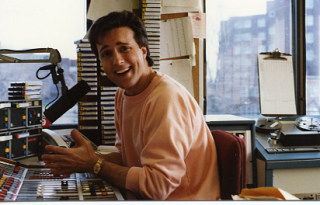 He is still on the air doing the mid-day run at community station CKWR. He says he plans to turn off the mic in December of 2007. 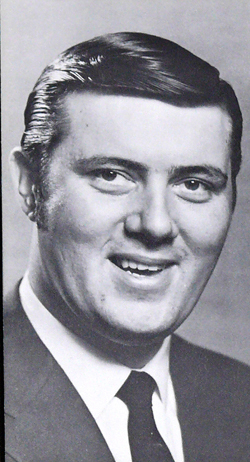 Fred started in radio in Orillia, where he started in the business. Fred has built a loyal following of listeners over the years and still draws decent BBM numbers in his time slot, considering he works at a community station with no budget to promote themselves. 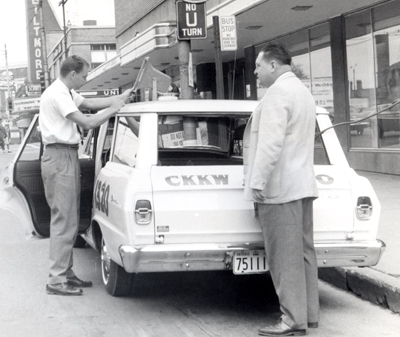 Don Cameron "Voice of the Kitchener Rangers"
cruiser reports and remote cut in's. Bob Farrow running "the course" in a media event at Ethel's on a sunny Saturday morning. 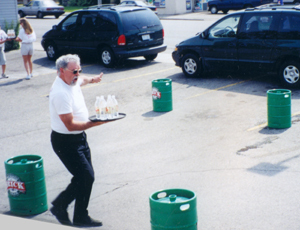 Carry the drinks around the slalmon course of Brick barrels, AND DON'T SPILL A DROP!! 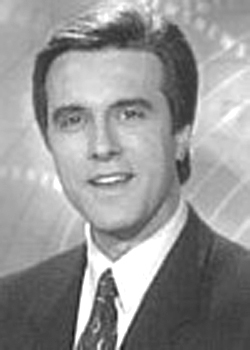 Tino and his wife Linda Brooks are now producers of TV spots, and North America's largest producers of Infomercials with their production company MONTE-BROOKS Management. Linda spent some time in the Broadcast Radio & Television course at Conestoga College before accepting a full time announcing position with CKKW / CFCA where she spent several years honeing her announcing skills. Linda is a excellent communicator. 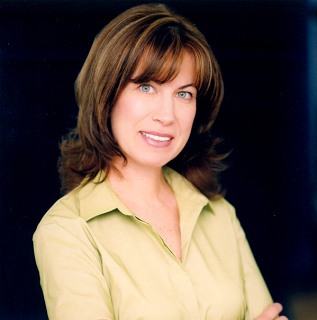 As a marital and business partner of Tino Monte, she is responsible for the Infomercial production side of Monte-Brooks Management. 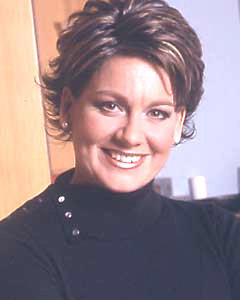 Linda is seen extensively on shopping channels in the United States and here in Canada, representing a variety of products. Here's a shot of Tino "hamming" it up in the CKKW controlroom during his 6 till midnight shift weekdays. 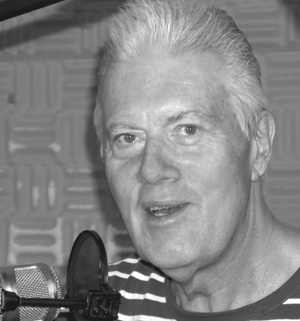 He used to amaze me with his ability to tape listeners calls, edit and splice them together to play as the intro to the next song . Tape and a razor blade; this was before the advent of computers in every studio. A short conversation, what song would like to hear? And, there it was!! All done and ready to go to air in two and a half minutes! And he did this night after night!